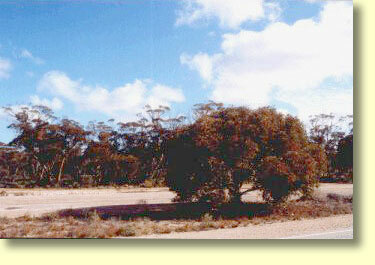 Yalata Roadhouse is situated 94 kilometres to the east of Nullarbor Roadhouse and 51 kilometres west of Nundroo. The Yalata Lands surrounding the Roadhouse are now occupied by the Anangu people. Originally many of the Anangu people of Yalata lived in the spinifex country far to the north around Ooldea, in the vicinity of where the Indian Pacific Railway now runs. Anangu people were forced to vacate these areas for a number of reasons, not the least of which was that the sands around Ooldea soak had begun to drift as a result of the railways overusing supplies. In the 1940s and 50s areas around Maralinga and Emu were used for Atomic Testing by the British Government of the day. 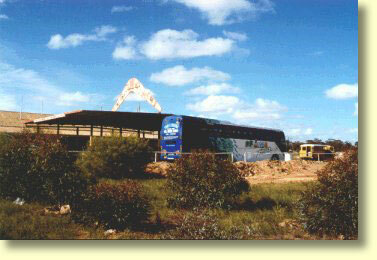 Around this time the Australian Government resumed much Anangu land to be used for the Woomera Rocket testing Range. These actions forced many Anangu people to settle more permanently in the Yalata area. In recent times much of the spinifex country has been returned to the Anangu people. Today the Anangu people still retain very strong links with their traditional lands - just as their ancestors have done for many thousands of years. 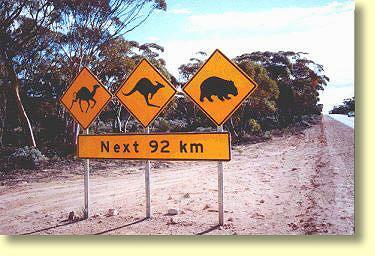 Camels .... Kangaroos .... and Wombats! Yalata Roadhouse has been allowed to run down for a number of years but under new management its friendly and helpful staff are beginning to spruce the place up. Yalata Roadhouse has a number of powered caravan sites and air conditioned units available for the budget traveller, backpackers and sports fishermen. Please note there are no onsite vans for hire. From the Roadhouse take away food can be bought and there is a very good selection of Aboriginal Arts and Crafts for sale to the general public. I should add that some of the carvings represent very good value. Yalata Roadhouse is generally open from 8Am to 8 PM seven days a week. 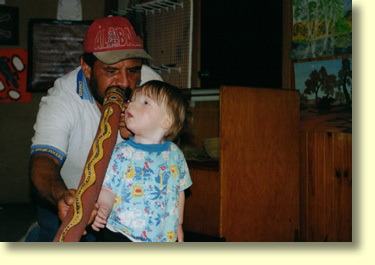 Should you wish to contact Yalata Roadhouse telephone (08) 8625 6986 or fax (08) 8625 6987. Yalata Roadhouse is a rest stop for travellers passing to the east and west. 78 kilometres west of Yalata is the Head of Bight. If you are heading west Yalata is a good place to purchase a permit to enter the Aboriginal and Nullarbor National Park Lands at the Head of Bight. Here Southern Right Whales can be seen in their winter calving and breeding grounds. The Bunda cliffs also begin at the Head of Bight and are a spectacle not to be missed - particularly for photographers. Alternatively travellers can obtain permits at White Well Ranger Station for $7-70 in order to access the Whale Viewing platforms between June and October. Concessional rates are $5-50 and children under 16 are free. Roadhouse staff are usually fairly up to date as to how many whales are present in the viewing area, so just ask how many Southern Right Whales are around. For serious sports fishermen there is a usable road from Yalata Roadhouse to one of the few fishing spots in this part of the remote Great Australian Bight. Here sports fisherman can catch Mulloway, Shark and Salmon. Locals reckon this area has some of the best remote sports fishing in Southern Australia. Reports of Mulloway catches in the order of 40 to 50 kilogrammes are not uncommon. To take full advantage of these fishing opportunities you will need a boat suitable for fishing in exposed waters. The road to the Yalata coastline is really only suitable for 4 wheel drive vehicles and you will need to approach Yalata Roadhouse staff to obtain an entry permit. Along the Yalata coastline are a number of remote camping areas including Yalata Beach, Goya's Beach, The Granites, Goombarra and The Hilton which has 4 separate locations. Perhaps the camp site with the most interesting sounding name is Bob's Kitchen. All of these camp sites are in ecologically sensitive areas and in all likelihood you will be the only camper for many miles around. 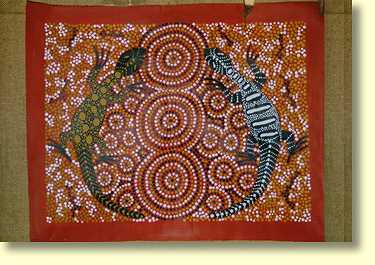 Whilst stopping at the Yalata Roadhouse check out the Aboriginal paintings, carvings and other arts on display. Some of the carvings are particularly good value. Yalata has some of the largest areas of undisturbed Scrub in S.A.